Here though, the purchaser and the consumer of services are not the same. So SIB's would be like the Wilson Parking version of mental health services. A couple of the local trees at Little Oneroa. 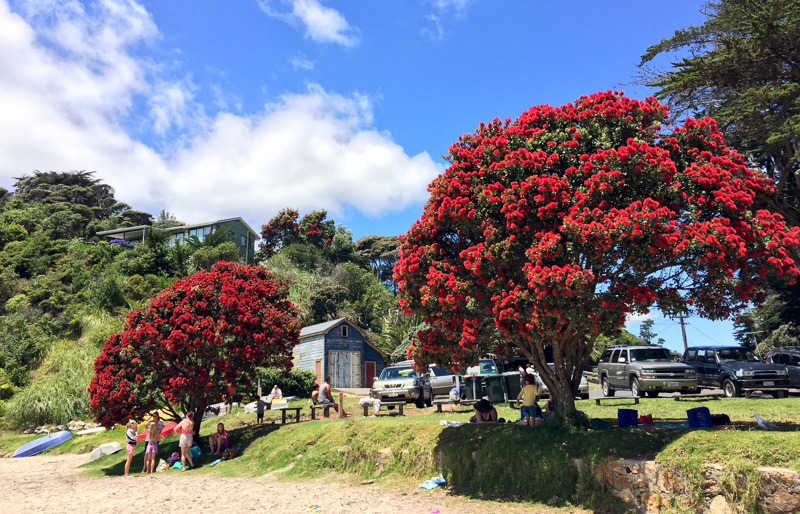 It’s certainly been the best year for pohutukawa at Waiheke that I’ve seen in ages. Long beaten to nominating "dirty politics", I'm just going to vote that it will be the eventual winner. The only other suggestions I have are TPPA and denial, although today's "procedural abomination" probably deserves merit. We fund tertiary education because a well-educated workforce strengthens the economy and pays more taxes – it’s an investment. And here's me thinking that we fund tertiary education because well-educated people can make the most of their talents for the betterment of themselves, their families and society as a whole. I suggest that until we reframe the argument the minutiae of student loan arrangements are the least of our worries. ...and speak the way New Zealanders used to on TV – the metallic local twang glossed with the plum that always came out for the cameras. One of the incongruities with "Underbelly Land Of The Long Green Cloud" is the characters all speak with modern Kiwi accents, not what I remember accents sounding like in the 1970's at all. in 1980 there were .45 PR people and .36 journalists per every 100,000 workers. As of 2008, that number had shifted radically. There are now .90 PR people per 100,000 workers and just .25 journalists. Not much into nationalism, but NZ's stance on nuclear weapons and indeed David Lange’s Oxford Union Speech are two of the rare things that give me a strong sense of national pride. Thanks for the mp3 Russell! Like many others I fondly remember DKD (especially their epic chocolate cake! ), but it always seems to me that Millers was first off the block. Both the websites state they started in 1984 (my 1st year at University), but can anyone here shed light on which was first? Oh, and here's a bigger version.